It's difficult to understand from the Western perspective the belligerence of North Korea. The weapons, the rhetoric, the behavior all seem strange. What people in the West often miss is the utter desperation of that country and its people. We underestimate the risks of North Korea's potential collapse and the leaders' actions taken to stay in power. If you simply look at the political map of North Korea, it's hard to notice anything wrong. Cities throughout the country, lots of coastal activity. 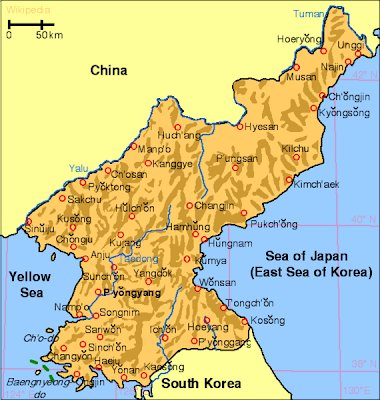 But take a look at this fairly recent satellite photo of the Korean Peninsula at night. It's a frightening picture of a nation living in the dark ages - literally. 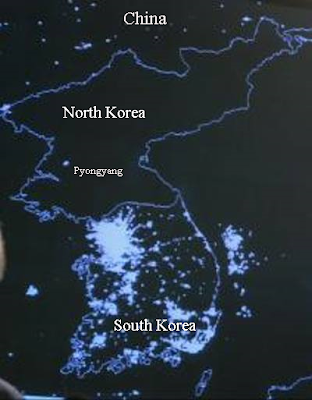 The only visible light is from the capital Pyongyang. The contrast with South Korea is startling. Even the vast reaches of rural China are somewhat lit up. This is a country so desperate for fuel that homes can not use electricity at night even if they have it. People are so starved, some are crossing into China. Think about it - people are willing to risk their lives to cross the border into rural China to get some relief for their condition. So all the negotiations, peace initiatives, and treaties, and threats (such as this one from the US) don't stand much of a chance. How do you rule 24 million people - starved and desperate? You build up fear of external enemies ready to destroy you at any moment - the US, South Korea, Japan. Giving people this external reason for their misery and subjugating the population with a massive army (the only people relatively well fed) allows the leaders to maintain control. Whatever the sources of food and fuel North Korea could tap into in previous years are now yielding less - all due to the global recession. And the more desperate the economic situation, the more tenuous the grip on power, the more bizarre and belligerent the behavior.